With so much talk of recession… and some actual slowdowns — some of them serious, especially within certain industries — businesses have a tendency to cut back in areas that can make matters worse. Marketing is at the top of the list. If you know me, then you know that I’m not in favor of untracked, unmeasurable and expensive advertising anyway. So, don’t get too upset if you think I’m thinking mainly of advertising… I’m not. What I’m referring to are the systems in your business that produce new prospects and/or customers on a regular basis. You do have some of those, don’t you? If not, then the time has come for you to put some in place. And fast! If you do, then it’s important that you proceed with caution if you’re eyeing them in your budget. First… we are happy to unveil a shiny new blog site that just launched. It is focused on small business marketing and already has a few posts on it (some of which were gleaned from other publications for which we’ve written). This reflects the renewed focus in our business: Epiphany Marketing. Secondly… there are a couple of big things coming in the next few weeks. So, this is an announcement about our coming announcements! But there will be some significant new opportunities for you as a business person to learn how to use applied strategy along with some free and low-cost technology to make sure that your future customers find you instead of someone else. It’s going to be big! Here’s a hint: there will be something happening in Sarasota. If you’re one of our many readers from across the US and around the world… not to worry, we’ve got something coming for you, too. Keep your eyes glued to this spot… and the new marketing blog, too! We told you previously about the armor we listed on eBay. This isn’t necessarily all that unique — people sell interesting things on eBay every day. What was unique was using a proven platform such as a blog in order to promote the listing. Well, we’re happy to report that the auction ended last night. We’ve already been in communication with the buyer (a “mate” from the land down under — howdy, Dan, if you’re reading this!). He seems like a great guy. We’ll be shipping his new purchase out to him tomorrow. The lesson? If you’re trying to get noticed, you can’t beat a nicely-placed business blog. From an internet marketing standpoint, this is nearly magical. If you have a business and you aren’t blogging, you’re missing out on a phenomenal opportunity to communicate with your existing and future customers. For those of you wondering about our traffic, I don’t have any other armor auctions to compare things to, so I can’t speak intelligently to that. 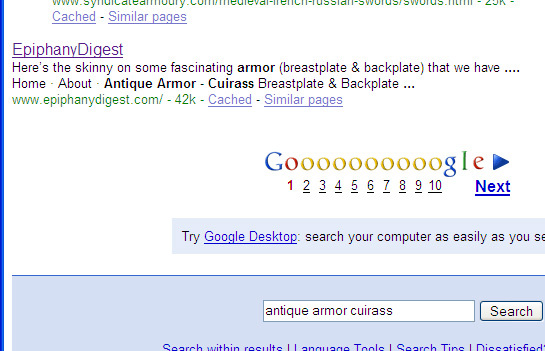 But on the blog site itself here, we had a significant spike in traffic looking for armor. Ironically, much of it seems to have come from Digg! If you can’t wait, here’s a great article we just found from the folks that put together the snazzy new design for Michelle Malkin’s blog. Why do small businesses build websites, anyway? I’ve come to believe that most of them (the businesses) are suffering from dysfunctional strategy. Perhaps hypo-strategy is a better way to look at it — a sort of neglect where it comes to developing any overall business philosophy or vision. Most small business websites do just about everything except what they should be doing.